I bought 1mg Alprazolam. the pills are oval like and are white. Scored on one side and the otherside has IFA on it. I don't know what dosage the white ones are, but I thought that the purple/bluish speckled tablets with IFA on one side (scored on the other) were the 1 mg doses. Were they shipped to you directly from Mexico? I bought them in Mexico . . Were they supplied to you in a prescription bottle or in the original manufacturer's packaging? Just wondering the name of the manufacturer as well. 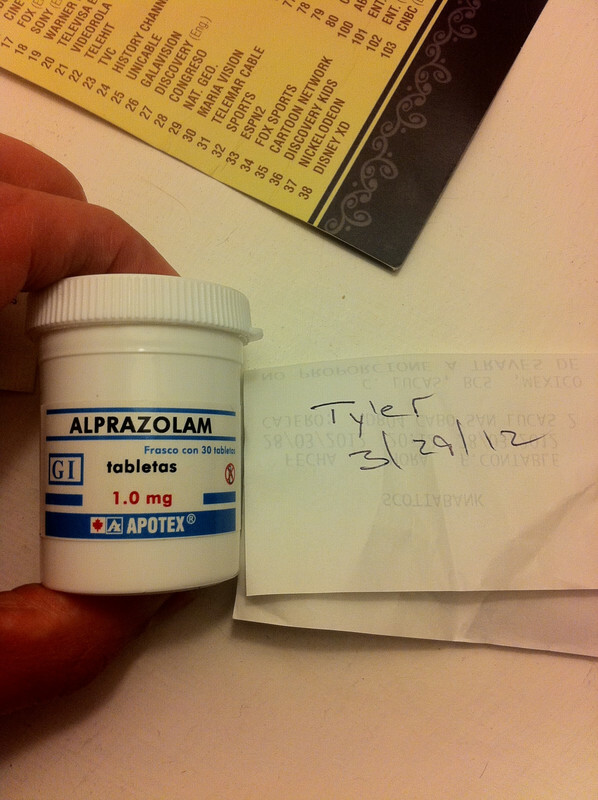 The markings do indicate the Alprazolam but I've been unable to confirm the dose amount. the bottle shows APOTEX and has a GI on it . . I was able to confirm Apotex GI is a manufacturer in Mexico, which makes sense. If you see the URL http://www.apotex.com.mx/productosgi/gi/alprasolam.htm They show a picture of the box, but unfortunately not of the pills. The dosage which is listed on that page is 0.25mg, but it very possible that you did get the 1mg dosage, just the manufacturer web site is not listing them. All in all I'd say that you did get the correct medication. Do you notice if they have worked for you as expected? I bought two SEALED bottles of 1mg Alprazolam by Apotex Pharms in Mexico. The pils are white, football shaped, marked "IFA" on one side and bisected on the other. The link is a picture of the SEALED bottle the pills were in. Are they legit? In this country, white, single-scored ovals are .25 MG.
Apotex Pharma, has a license to manufacture,the benzo alprazolam, from Protein, S.A.de C.V. Damas 120, Benito Juarez San Jose Insurgente, 3900 Mexico Df, Mexico. Source: Martindale page 1356, 36th edt, first published in the year 1883, covering 40 countries. (Stillnox/Ambien), Diazepam, (Roche Valium) and, Roche Klonopin/Clonazepam, with USA labels with my name on them and tracable controlled substance numbers. took my USA US Airways Barclays Bank cr card. placed the blisterpacks, in my front pocket. best, only 20% of the allegeded content, if that. hotel/Spa/with 18 hole Golf Course, "oceanfront". The lady is bi-lingual, and asks me what do I need? 1 mg footballs, and, sixty (60) brand Sanofi Stillnox. public lobby, in front of the Concerige (Publicity director) My charge card is approved and I return to room. the Valium and Stillnox,all appearing very real!!!! 240 pills I purchased, in blisterpacks. I travel by plane the next day. USA script for Xanax or Tafil, nor any Mexican scripts!! and stapled pills,..............WORSE YET, THE FIRST BAG OF BLUE ROCHE 10 MG VALIUMS (58) LOOKED REAL, BUT, WERE VERY HIGHLY DILUTED. AT BEST ONLY 2 MG OF DIAXEPAM, IF THAT, "not the high potency pills I purchased the day before i left". A business center employee, and, the Publicity Director, were not that stupid, I used the business office, to re-package the pills the day I left, in private, but, they knew what I was likely up to. escellently vacuum sealed look a like controlled substances, abound in Mexico, (as well as around the globe). My test case in Los Cabos, proved to me that I bought either sugar pills, or, pills vastly reduced from their advertised content. counterfeit, watered down pills, found all over Mexico. and I am convinced the unstolen pills I received, were duds. I had little time to build up Benzo tolerance. My associates, felt the pills received in the mail were weak if not total duds. I'm sorry but if you bought that in Mexico, mailed it to the USA, and expected you'd receive it all intact, you're not thinking. The very fact that you could get so much of whatever you want in Mexico should've told you they're all corrupt and will take you at any chance. Find one of the thousands of Drs in your area who'll write for Xanax and never do this again - not alone anyway. Are the meds you order for real. Do they really help? This information has been independently compiled and is for informational purposes only. It is not intended to be a substitute for medical advice from a qualified healthcare professional; nor is it intended to diagnose, treat, cure or prevent any disease. For more details please see the Medical Disclaimer. This page was last updated on 1 May 2017.